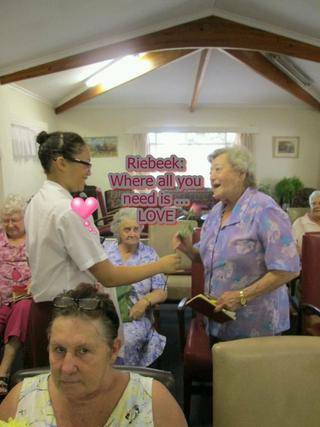 It has been said that your education has been a failure if it has failed to open your heart and the heartfelt laughter, genuine interest in others and the comraderie of our reunion groups show that our Riebeek Ladies have had a hearty not failed education. Let’s peak into the hearts of these groups by way of introduction to each group and then we will ask each group to stand so we can give them a hearty applause. 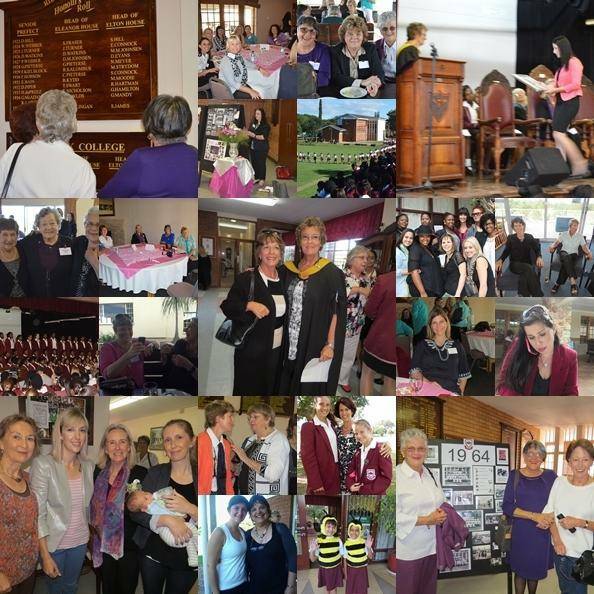 The Class of 1964 celebrate their 50 years with the co-ordinator Ria Botha Meyer. 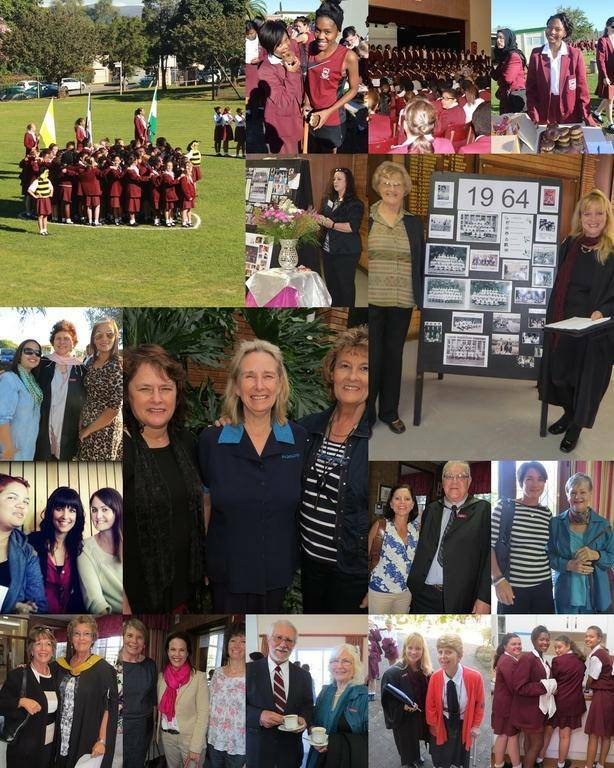 Ria’s mother MARIA KINGHORN BOTHA is a Riebeek Old Girl of the 1920s and Ria remembers being enrolled at Riebeek, her heart pounding, and being amazed that her mother knew the school secretary. You have to be very important to know people at a big school. At their 40 year reunion 5 of them had a riot they say and RIA, president of the RCOGA from 1990 to 1992, thanked Mrs Stear for allowing the Old Girls at each Founder’s Day to take over and create total chaos in the foyer. Seven classmates married childhood sweathearts. They noted that the older ladies at their 40 year reunion had given new meaning to the phrase – growing old gracefully. We note that 10 years later the same can be said of them. The class of 1969 celebrate their 45 year reunion and were enthusiastically co-ordinated by Denise Mowatt du Plooy from Johannesburg (who played league 10 pin bowling and achieved provincial colours in 1993). They listened to the landing on the moon on the school intercom as there was no television in their day. Dr Jean Van Onselen taught 50 of them in one class of youngsters in the old Riebeek school building. Mrs Woods' sister Carol taught them a mnemonic for the order of the planets: Mr Van Niekerk Eats Many Juicy Sandwiches Under Nellie's Pillow. They have dedicated their presence here to their highly regarded Std 7 and 8 teacher, Mrs Denise Cranke, who passed away in 2010. If Mrs Cranke discovered that anybody was eating in class they had to eat everything including the wax wrap of the sandwiches, and chewing gum was a total no-no, as she would put it in their hair, down to the scalp! They can still visualise her smacking on their palms with a ruler the verb rules: Am, are, is, was, were, shall be, will be, seems to be, appears to be, became. What delightful ladies they became. The Class of 1974 celebrate their 40 year reunion with Lynne Thomas Griffiths as headgirl, guest speaker and the reunion co-ordinator. They wore white dresses to the Matric farewell dance with slits only to the knees, no cleavage and no low backs; and live bands played for the evening. The 1974 hit song Memories – The Way We Were is particularly poignant to them today. The Class of 1989 celebrate their 25 year reunion. 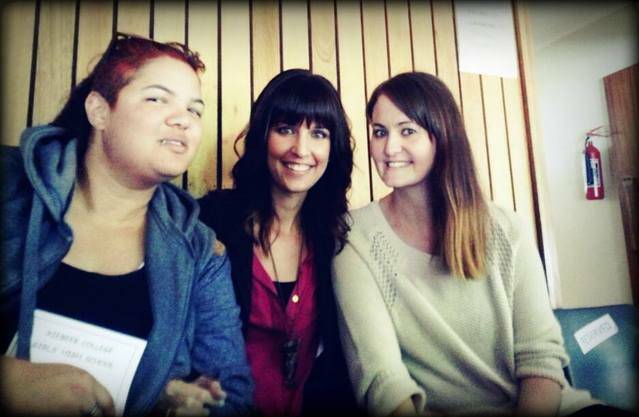 Headgirl Stephanie Mitchell Jamieson is overseas and Miss Riebeek 1989 Lauren Gouws Frueholz took on the task of co-ordinator beautifully. They are grateful to Mrs Swart for teaching them how to rinse out a dishcloth properly after cleaning up. Mr Ossher is remembered fondly by Melaney Geldenhuis Olwagen – she is currently furthering her studies and recently realised in an accounting lecture that it’s the subject that puts her to sleep, not the teacher. This class has in its ranks the vivacious Natalie Bright Wilmot who has done much good work in autism awareness and whose sister Mrs Lesley Young, a much loved English teacher, will be joining us for lunch; and Jennie Lynn Roberson whose nickname was grootbek. They remember writing letters to Lady Diana and As they are from the era of way back when, they prefer proper spelling (taught by the wonderful English Teachers, Mrs Woods, Mrs Potgieter and Mrs Stear) to L.O.L. They remember watching the royal wedding of Princess Diana – and dreaming of being princesses one day. They remember sleeping next to the lions at the Seaview Game Park camp. The lion hearted princess class is what we call them as a result. theme was Planetasia and though not from another planet, they are here. The spirited, dramatic and some would say LOUD Class of 2004 celebrate their 10 year reunion with Cindy Rabie as headgirl and reunion co-ordinator. One of this class is still well known in the corridors of Riebeek College: our English teacher Mrs Cherise Lowe Swanepoel. Speaking of corridors, one corridor incident saw a group of prefects (including the deputy headgirl and our own Mrs Swanepoel) being sent out of English class for not doing homework. They were finishing the said homework in the corridor when Miss Bekker, the headmistress, walked past and queried why prefects had been sent out of class. They quickly explained that they had done their homework and were sent out while the teacher was dealing with the naughty ones in the classroom. Fittingly then, the school motto that year was “Your attitude determines your altitude”. The matric farewell moved back from the town hall and what better theme for the dance being in the school hall than Heavenly Dreamland. The first Cultural Civvies Day took place. The matric class were asked to write about their favourite items from their childhood: Caitlin Miller wrote of her doll but then conceded she moved on to Barbies and then more importantly, Barbie’s partner, Ken. Ma-aasha Ismail wrote a poem THE JOURNEY ending with “Excitement and chats will happen when we meet again…”. “That prophecy has come true today. In addition, there are a number of Old Girls here today who are not part of official reunion groups. In the Class of Experience is Elaine Smith Dullisear of the Class of 1947 and Verna Le Roux Barlow from the Class of 1952, Wendy Robinson Collier from the class of 1963 joins the class of 1964. Jenny Allen Anderson – class of 1964 – is joined today by her mom , Gladys Minnie Condon from the Class of 1940 (she and Dr Jean van Onselen are the last surviving members of this class). Denise Matioda Shaberg is attending today as headgirl of the Class of 1984. We introduce then these Old Girls and any other of our Old Girls from other reunion years not formally mentioned. Special mention must be made of a Class of their own, the reunion co-ordinators for today with hearts of gold. They have whatsapped, facebooked, bbmed, stalked, phoned, begged, pleaded and reconnected and been tireless snoopers and investigators to ensure that they traced their classmates. Their grace in tolerating our many requests and their kind manner in their communications with us is much appreciated. Some things just get better with old age, and our reunion groups have a wonderful chance to see how much they have gotten better. Comments overheard about reunions include: I had the strangest experience at my high school reunion – a lot of my class changed so much, they didn’t recognise me. I don’t want to brag or make anyone jealous but I can still fit into my high school earings. High school reunions – because you can’t hug a friend on facebook. It appears someone invited a lot of old people to my class’ high school reunion. These comments serve to prove that a trip to nostalgia now and then is good for the spirit… and the heart. We wish our reunion groups a spirited and hearty reunion. Click here to see the official reunion group photographs.